So you’ve fallen into a cave, just you and some of your buddies. I guess now you should try to find your way out before the batteries in your flashlight run out. Well…get to work! Oh, and did I mention there is something down here hunting you? Multiple somethings. 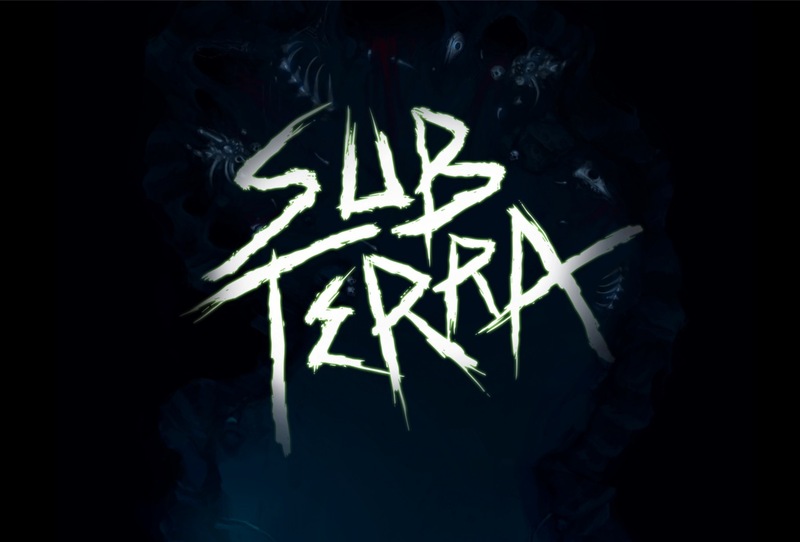 Sub Terra is a cooperative survival/exploration game. You and your team must explore enough of the cave to find the exit, and get enough of your team to safety in order to win. The problem is that this cave is prone to Cave-Ins, Tremors, Floods, Gas, and Horrors (creatures who are hunting you). And you forgot to bring extra batteries, so you have a limited time in which to escape. Good luck – you’ll need it. Gameplay: So let’s take a look at how to play Sub Terra. Each player will pick a different character (from 8 possible in the base game), each with their own unique abilities, and everyone will begin together on the Start tile. Your goal is to explore the cave, find the exit, and get everyone out (you will be building the game “board” as you go). But, there are a lot of tiles to explore before you get anywhere near the exit, and a bunch of those tiles have dead ends or challenges to overcome each time you enter them. So, you have to spend your time wisely, and balance between being cautious and pushing your luck. Otherwise you will never make it out in time. 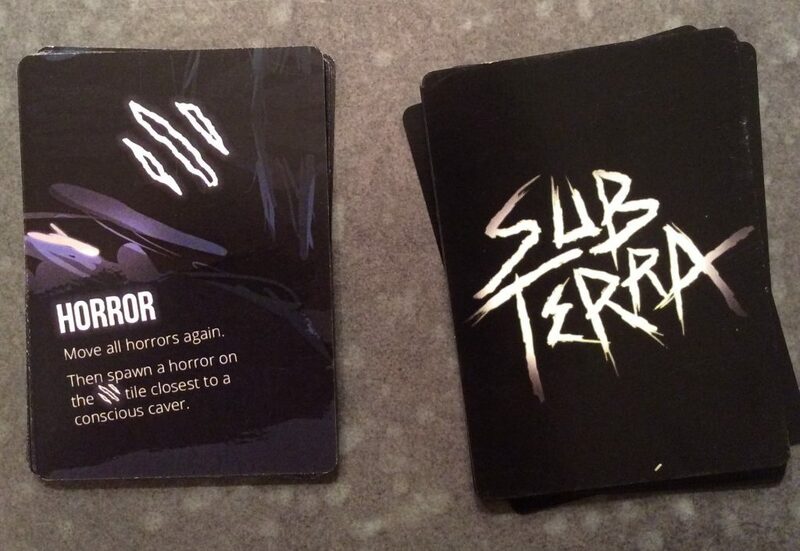 Every round of the game consists of 4 Phases: 1) Action Phase, 2) Horror Phase, 3) Hazard Phase, 4) End Phase. You play as many rounds as you need or as are possible. There are 22 Hazard cards that act as a timer for the game (less cards with 5 or 6 players). When the Hazard cards run out, bad things start happening fast. 1). Action Phase: Each round starts with the player who has the First Player token (imagine that), and then plays clockwise. 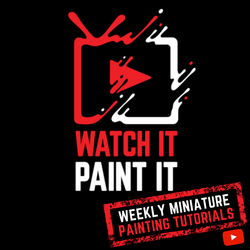 On your turn, you spend 2 action points to perform any of a bunch of different actions – once everyone has had a chance to perform actions, you move on to Phase 2. So… what can you do? Possible actions are wide-ranging and depend on the tile you are on and the character you have chosen. Basic actions are almost always available and cost either 1 or 2 action points. Moving one tile takes 1 action point, Healing takes 2. You can also Run (moving three tiles) for 2 action points (helpful when escaping from Horrors). The other basic actions are Reveal and Explore. When you use Reveal, you choose an available empty space adjacent to the tile you are on. You then flip over the top tile token and place it in the space you indicated. Exploring is quicker, but much more risky. When you Explore, you throw caution to the wind by revealing a tile and immediately moving onto the tile. This can save you a great deal of time, but also makes you vulnerable during the Hazard phase. Other actions pertain to the Hazard tiles you will reveal. It takes 2 action points to enter a flooded tile using the Swim action, or to enter a very thin passage using the Squeeze action. You can spend 2 action points to remove rubble caused by a Cave-In using the Dig action or spend 2 action points to hide from a Horror. You will also need to use the Rope action to overcome ledges and slides by spending 2 action points and rolling the die. There are also Rough Terrain tiles that force you to pass a skill check in order to not lose a Health point. You may also Exert yourself and perform a third and final action on your turn, but you must pass a skill check with a roll of 4+. If you fail the skill check, you lose 1 Health point. 2). 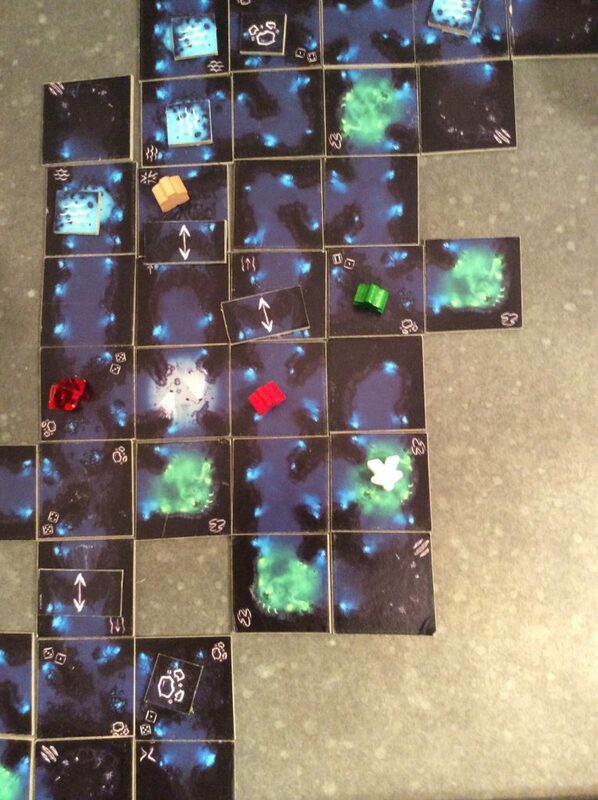 Horror Phase: If there are any Horrors on the board, they move one tile closer to the closest conscious explorer. If the Horror is ever on the same tile as one of the explorers, they immediately lose all Health points and are knocked unconscious. If your explorer loses consciousness, it is up to another explorer to revive you by coming to find you and using the Heal action. If a Horror is ever more than 7 steps away from any conscious explorers, the Horror is removed from the board. 3). Hazard Phase: Reveal the top card of the Hazard deck and perform the action listed on the card, then discard the card (all of these cards have negative effects). Cave-In: Roll the die. Place a Rubble marker on any tile with the Cave-In icon that also has a die icon matching the rolled value. The rubble now blocks the explorers’ way. In addition, any explorer that was on that tile at the time of the Cave-In loses 3 Health points. Explorers must use the Dig action to remove the rubble before being able to move onto that tile. Flood: Place a Flood marker on any tile with the Flood icon on it. Any explorer currently on that tile loses 1 Health point. Explorers must use the Swim action to enter the tile. Gas: For the entirety of the next round, all Gas tiles will be active. 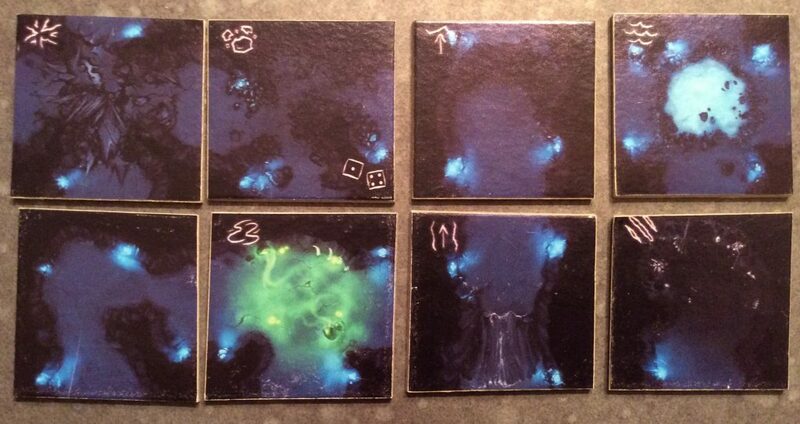 Any explorer who is currently on one of these tiles or who passes through one during this round loses 2 Health points. Tremor: A minor earthquake occurs. All explorers must roll the die to successfully avoid injuring themselves. They are successful on a roll of 4+. If they roll 1, 2, or 3, they immediately lose 1 Health point. Horror: Another Horror is released to hunt you. First, you immediately move any Horrors currently on the board one step closer to the closest conscious explorer. Then you add a Horror to the Horror tile that is closest to a conscious explorer (there can never be more than 3 Horrors on the board). 4). End Phase: Pass the First Player token to the left, and start the next round. So…How is it? Sub Terra plays a bit like a combination of Betrayal at House on the Hill and Burgle Bros., which is absolutely fine by me, since I love both of those games. There are a lot of decisions to be made every turn and the players MUST work together in order to succeed. If an explorer wanders too far on their own and is knocked unconscious, it might be very hard for someone to get to them and revive them. But, you also can’t be too cautious and all move around huddled together or the Hazard deck will run out long before you find the exit. There are 64 cave tiles and the exit will be in one of the bottom 6 tiles (so I guess it’s also a lot like Escape: Curse of the Temple). But, there are only 22 Hazard cards, so time is ticking away rather quickly. You have to do a great deal of spreading out and using the Explore action to push your luck in order to win. Plus there is the randomness factor. Tiles are shuffled and drawn at random, so the cave will be completely different every game. 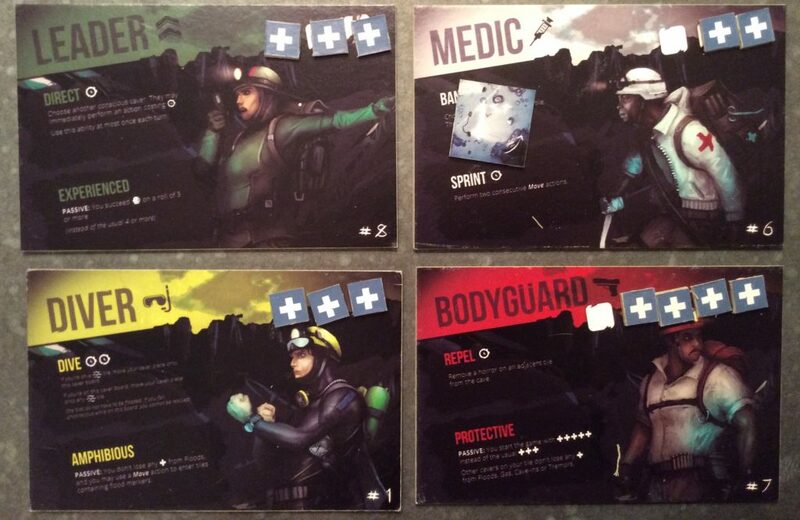 The Hazard cards are also drawn randomly, so the Hazards will appear at different times each game. And you have the dreaded die. Each time you are forced to roll a skill check – either for Ropes, Cave-Ins, or Tremors – you have the chance of failing or taking damage, causing you to take more time to try again or heal. Your team can plan for the end of the game if you start coming back together once the tiles start running out. You know that the Exit tile will be somewhere in the last 6 tiles so once you get close, you had better be regrouping. The characters add a lot of variability and replayability to the game as well. Each one has unique abilities that change the gameplay and greatly effect the decisions you make. The Bodyguard is awesome since he can kill a Horror. The Leader can give another player an action. The Scout gets to eliminate tiles and hide from Horrors. And there are 5 more. Each one adds complexity and differing strategies to the game, and I’m not sure you can win without fully exploiting all of their abilities every chance you get. Final Thoughts: Sub Terra is pretty great. The gameplay is well thought-out and moves at a quick pace, without anyone’s action taking too long. There is a great deal of group interaction as you all get to decide your course of action together. But, as with any group, one of you might choose to go rogue and get trapped in a cave-in (see, we told you that you should’ve listened to us). The only time there was ever any down-time was when one of the explorers was knocked unconscious. Until you are revived, you are basically sidelined. There is enough randomness to accurately represent being lost in a cave, but not so much that you end up hating the game . There aren’t too many tiles that are complete dead ends, and all of the others can be rotated to provide valid pathways to be further explored. 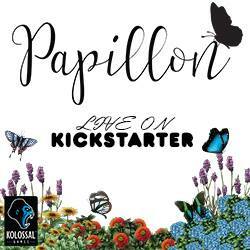 The game’s components on the Kickstarter page look great. The prototype I received was quite a bit rougher so I’m glad to see they were able to upgrade the pieces. Because of this, my pictures really do not do it justice. If you have any doubts, go check it out – you won’t be disappointed. They have also made the tiles brighter and much more clear. Another great addition is that there are now three expansions available which add more/different Horrors to the game. This will ramp up the tension and really drive home the creepy horror aspect of the game that much further. The game was definitely not a walk in the park for us. It provided enough of a challenge without seeming unwinnable, and still maintained the fun. We will definitely be playing this one many more times. Hopefully, one of those times we will all make it out alive. Inside the Box Board Games provided us with a copy of the game as part of the Everything Board Games Network in exchange for an honest review, which is exactly what we have provided. You can find Sub Terra live on Kickstarter between now and February 16, 2017. 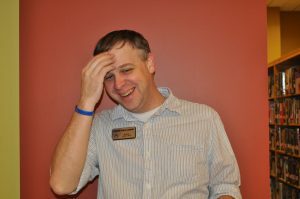 Jeremy Davis from gamegeek.ninja is a game fanatic. More than happy to play games for more than 12 hours at a time, he loves new games and is always on the lookout for his next favorite. He's a bit crazy, but that adds to the fun of his opinions. Also, Ninjas sometimes help with the reviews, so there's that.